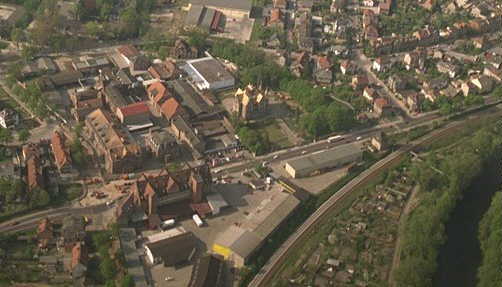 The Richter factory is in the foreground, with Rudolsbad in the center of the picture. The Richter Villa is found on the right. The building in the mid-background of the picture is the military base from the German Empire (pre W.W.I) era. The large light-colored building on the left was for officers, the long low redish building was the barracks. The buildings are still in good condition, despite having been abandoned for years, and is being rejuvenated today. The building in the far background is Heidecksburg, the residence of the Prince of Schwarzburg-Rudolstadt. The railroad along the river bank can also be seen. Rudolstadt (English or German, a new link -- check it out) looks much the same today, with all of the buildings clearly identifiable. Thanks to LP gas, the brown smoke haze is gone and Rudolstadt is today just as bright and clean as it looks in this picture. This area of Germany suffered no war damage, so all of the buildings (and the murals in Heidecksburg and the inlay work in the Richter Villa), are original.